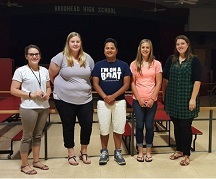 On August 22, four new Teachers and a new Middle School Counselor participated in the first day of the Brodhead School District New Teacher Mentorship Program. Dolly Phillips (HS Art), Heather Boeke (4K), Jake Shanahan (MS Counselor), Mariah Ahrens (5th Grade), and Crystal Holtsapple (HS Special Ed.) were all welcomed to the District. Some of them have previous teaching experience, but for a few, this is their first teaching position.